Note: We moved several Signs In Movies into this single post. 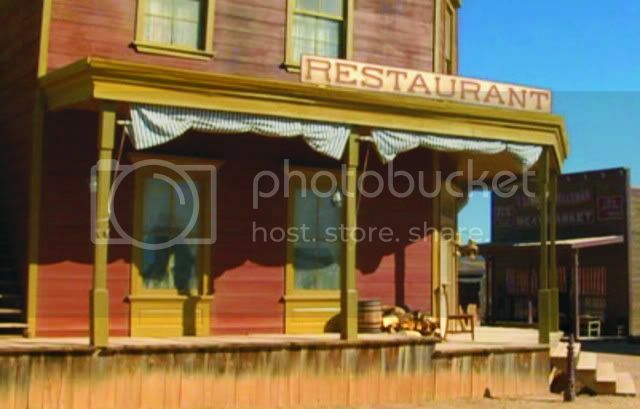 Check out The Shootist with John Wayne some nice glass and hand painted signs also Jack the Ripper with Michael Cain a lot of scenes take place in a English Pub lots of glass,looks like it could be acid etched. I'm always late seeing flics. Finally I saw Seabiscuit and am wondering what anyone thought of the signs. I thought they were pretty authentic, but a little too perfect. The camera did catch a brush stroke up close and personal so you could tell it wasn't vinyl. Yes, I thought they did a good job on the signs in the movie. Considering some of the race tracks probably had good budgets for signage, and this time span might still be the golden age of hand lettering, I think they hit it pretty well. I was watching Pearl Harbor on DVD here the other day and saw one shot from inside the barber shot--looking out. You could easily see the double stroked hand lettering in the front window. Tyler and I watched The Last Samauri last week. There were some really nice victorian age sets...not too many signs but well done across the board. I took Darla to see Cold Mountain a couple of days ago. It had quite a few understated signs scattered around the little town. They weren't quite as dominant or plentiful as in Open Range, but they did add some flavor to the town. Lastly, I don't recall seeing any signs in the Lord of the Rings trilogy, but I really enjoyed the ornamentation in the buildings and props. There might have been a time when the movie studios snuck some vinyl into some of the retro movies, but it seems they are over that by now. 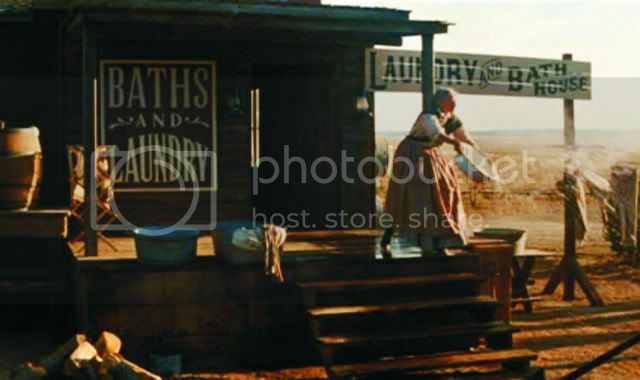 One of the first signs I noticed in that movie was the window lettering shot from inside the Bicycle shop looking out. You could see the brush strokes in the lettering & outlines. I thought there were many appropriate examples. I've worked with the art director of Seabiscuit in the past and she is into keeping things more genuine than computer fonts on period pieces. I have not yet asked who did that show. In the "Fellowship of the Ring" the inn they met Aragorn at had a hanging sign out front. It was shown when the 4 Hobbits first arrived. The only reason I know this is I watched it last Tuesday and was looking for cool signs. It's the only sign of the Trilogy. I watched Lord of the Rings last chapter the other day, and the two previous shows have been on cable almost all the time lately. Tyler read the books and keeps me filled in on what is happening in the movies if I get lost. Anyway, the underlying plot of the movie is "The Ring" is trying to get back to its master. As I read some of the posts about Angel Gilding here, it appears the Angel Gild formula(s)/Process is trying to make itself known to all again. While there may be a few with financial interests in keeping it a secret, I can only say IF it wants to be known, this will probably be THE place to do it. If and when that happens, I'll be happy to create the page or pages in the Rick Glawson section. Even if the actual formula becomes public knowledge, I suspect there will be a few people like Sarah King who will make it easy for the rest of us by supplying all the necessary chemicals with one simple order. From what I have seen, dissolving the gold into gold chloride takes quite a few delicate steps, along with some potentially dangerous acids. The beauty of the Hand Lettering Forum would be a sounding board for people working on the process. It appears there are three or four very qualified readers here to help the rest of us. After reading the formula for Angel Gild and all the close tolerances for mixing it would seem to be a lot easier just to order it from Sarah. There are so many variables to the formula that it is evident there would be a lot of waste until the precise procedure is finally found. Not to mention the danger of working with some very potent chemicals. What is great about this forum is that so many are willing to share what they know. The "secret" of the Angel Gild formula may be persued by some for financial gain, but I suppose most just want to know how it is done for their own satisfaction of knowing and producing it for themselves. The discussion between Robare and Chris seems to be one of the more fascinating that I've read here to date. I have no inclination to ever follow the process personally, but find that knowing it elevates my appreciation. Having the process more public, enables improvements without needing to start at the beginning. I don't think the making of this solution will make anyone rich, but it enriches all of us that use it. Thanks folks. Oh, Mike, I also appreciate your comparison to the theme in the books. Rick gave "his" formula to a few people for safe keeping, and there were other formulas that worked, too. While most of us in the sign trade depended on Rick Glawson for our Angel Gild kits, there were numerous other glass and mirroring people all around the world using it day to day without regard to the sign trade. Now that Rick's estate has been settled, and it appears Lola has no stake in the formula, it looks like the numerous formulas are getting restless--wanting to be revealed. At one time, I felt the need to keep it secret because it was part of how Rick paid his bills. As you mentioned, I doubt that more than a dozen or maybe two dozen people would ever pursue the production steps, even if the entire step by step process was made public on this site or somewhere else. From my personal standpoint, this all resembles a vehicle. I don't want to make one, nor fix one. If the purpose of the vehicle is to get me from one place to another, I only need to know how to drive it. It is nice to know the formula won't be lost, all the same. For me, it is like paints. I like to know the chemistry so that when something goes wrong or I need to tweek the product, I know where to start. While I "made paints" in small batches at the Garnerville Plant, I have no desire to do so either for myself or as a trade. I feel the same about gold chloride. What I get paid the big money for has nothing to do with making my own supplies. Rick tweeked known formulations to get a solution that worked well for his purposes and many of us benefitted from that work. He also spoiled a lot of batches in getting to that formula. I am certain that there will always be a source for a workable material. Our knowledge base can only help those suppliers provide us with the best product for our purposes. Darla and I went to the new movie "Elf" tonight. Towards the end, there was a real sign painter with a mahl stick lettering a door. Refreshing! Lately, many similar instances show someone peeling the transfer tape off the vinyl lettering. I personally enjoyed the opening credits sequence. Great illustrations!..and fun use of showcards with digital characters. If you are a fan of Saturday Night Live, you will enjoy the movie. I love that movie, and just bought it over the weekend! I now have to look for the signpainter. Regarding the Movie "Elf", and the signwriter lettering the door, his name is Cam Sterling, of North Vancouver, B.C. I worked alongside him for the last 2 days, on the series the L Word, here in Vancouver. Cam is a very neat guy, 51, started lettering in '76, got into IATSE local 891 about 8-9 years ago... He has perfected the "aged letter as he letters it", we use latex almost exclusively. I've worked on a few shows with him, i'm the newbie in the bunch here, there's a few more guys and women that have ben doing it,for awhile... got it down. I asked Cam if I could post this, as I ha remembered this post subject from awhile ago, he said"sure" it's so much fun to work with him, we reminisce about the old days in Vancouver when brush was king and beer was cheap! We worked on "The Five People You Meet in Heaven" a MOW, all 20's/40's period signs and decor, I learned So Much from him and Peter Weissart sp? any, I ramble, but it's Cam lettering the door, he thought they'd only show his hands, but they got him all. ps, he does a good John Wayne voice too! pss, haven't seen it yet, but Santa Claus 2, made here, is Full of Signs, Cam was one of a group of signwriters and Scenic Artists, everybody says it's a real Fine one. "Badlands" with Martin Sheehan and Sissy Spacek. 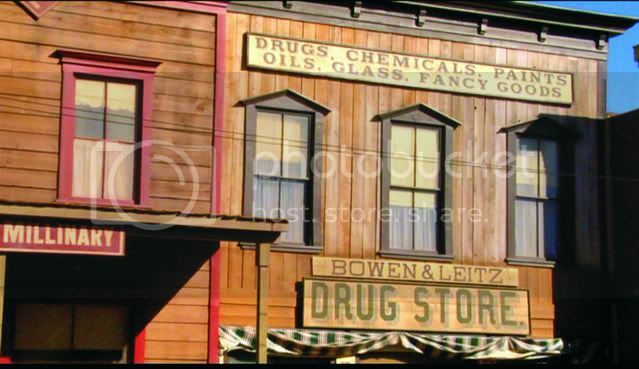 Her Dad, played by Warren Oates, is a signpainter and there are some shots of him working and his shop area. There is also a continuity mistake in one scene where he's painting and the sign is painted in an area then blank in the same area. The signpainter is also the first guy to die in the movie. I think that signs for movie production is a really good market for signpainters. There is so many movies out there where the style, typeface and look of the signs, especially period signs, are not accurate. Movie production also suffered from the "take over" of the "graphic designer that knows to design everything"
It's a shame when you see vynil signs with clarendon fonts in period movies. 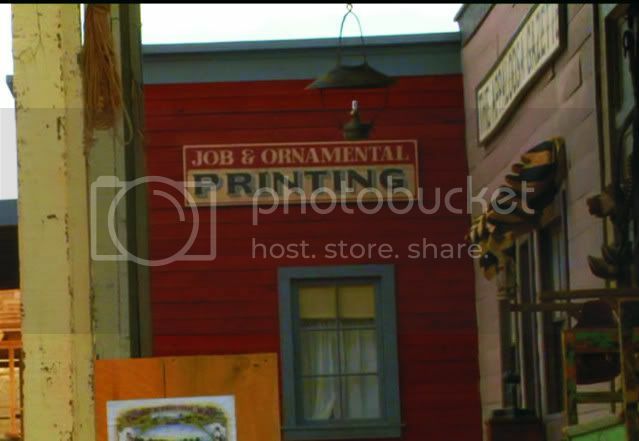 There is a place for a signpainter in almost every movie, probably between the graphic design, the art director and the production designer. One signpainter that impressed me in movie production is Fred Seibly who worked on "Harlem's nights" and a few others. Very accurate period signs. I love the signs in "Road to Perdition" with Tom Hanks as the mob enforcer trying to raise a family. The plot is great but the signs are even better. Only one nagging worry; I suspect many of the rooftop billboards were the dreaded digital stickers. It only makes sense that the same blight infecting the real world would encroach on the cinematic "world" of the 1920's, too. And I'll even bet it's possible that a few of the ghosted wall signs seen briefly from afar might've been pasted into the scene by some PhotoShop jockey! I don't wanna know! ...and if you get a chance to see that Mel Gibson alien flick called "Signs": give it a pass. There's only one sign in the whole movie--and it's rotten. Talk about false advertising! 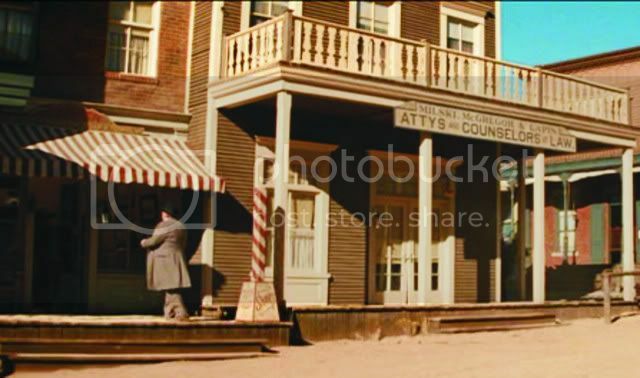 The signs on "Road to Perdition" were painted by "Monk" Moncton who lives just outside Chicago. I worked with "Monk" on the film "Big Fish"
I have also worked on the films "Blue Skies", "Fried Green Tomatoes", "The Rosa Parks Story" for CBS, "The Grass Harp", and "Long Walk Home". I find this kind of work through the Alabama Film Commission and average a 1 film each year. Contact your local state film commission. There is a really nice effect in the intro of the Tonight Show with Jey Leno. 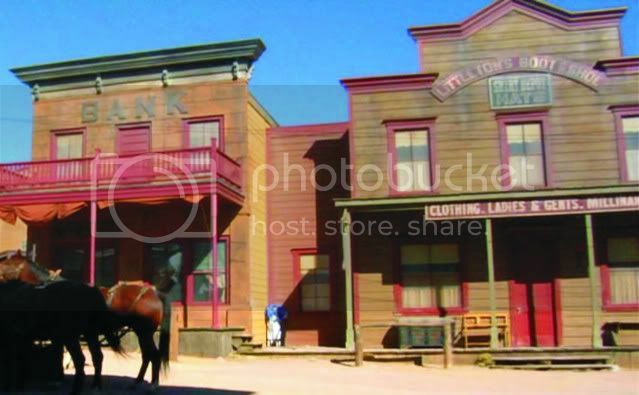 They run the camera, then get a quick digital snapshot from one scene and superimpose it onto a brick wall (among other surfaces), as Jay walks across the live scene. They may have done that very thing in the movie, but I find it to be very impressive either way. Since this topic came back up to the top, I should throw in a couple more movies with well done signage. I just watched "The World's Fastest Indian" (about the world's speed record on a motorcycle) and it was peppered with nice old hand lettered signs in the style and period of the '60s from both New Zealand and the US. Also, I watched "Eight Men Out" about the Chicago Black Sox game fixing scandal. There were plenty of hand lettered signs and fence panels at the ballbarks. For that matter, almost all the old baseball movies had good signs in the outfield including movies like "League of their Own". I saw a TV clip of Robert Duvall talking about his upcoming new series about the West. I don't recall the name off hand, but he says it is going to be in the vein of Lonesome Dove and Open Range, so I suspect it will have nice sign designs. Gotta add a favourite....the work in the Ken Burns series "Jazz" is amazing...and all historical footage to boot! "The Sting" was on TV last night and I watched a bit of it. The movie has quite a few signs on the sides of the brick walls and painted signs scattered around on buildings and windows. "Back to the Future" was on a few days ago. There are signs on the vintage downtown square, along with a subdivision sign. Some of them may still be seen at Universal Studios park in LA. Today will be my last day working on a Movie,"All Lit Up"(just recently renamed "Deck the Halls") with Danny Devito and Matthew Broderick. 2 other signwriters and i have spent the last month handpainting well over 150 signs, small to large, 2 ghost signs, Christmas windows.... it's been the most fun in the 4 years that i've been in this side of lettering! Of course, it's all latex, designs by the "Art Dept"(read, computer designs) but we got to put some of our spin on things. Well, now it's time to get a little more sleep, and then on June 14(our 38th anniversary!) fly to Albuquerque, NM, and tour the state for 2 weeks. I'm looking forward to signs and scenery, and to get out of the Rain here! btw, i turned the other guys on to to Mack waterborne brushes, tan handle w/ brown handle tip.... we spend close to 500.00 with Canadian Signcrafters Supply, out of Bayfield, Ontario, Canada...Thanks, Jennifer!! 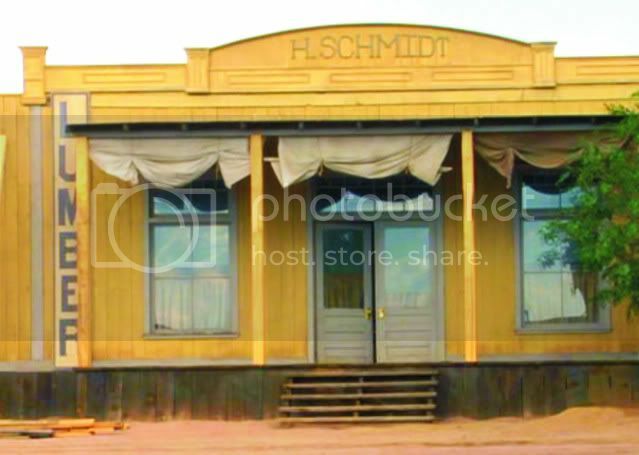 When I was working on "Big Fish" , Sony Pictures was adamant about no cameras and no photos of anything in the production dept. "Back To The Future III"
Well, I don't know if I'm workin' this thing right or not. I'm responding to a remark that Mike made about "Back To The Future III". 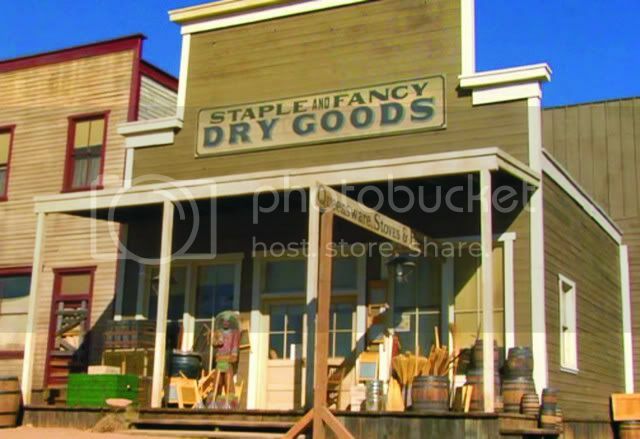 It was filmed here in our county in northern California and I was not about to be left out of working on it. The movie was all anyone was talking about for months....Small town, here. 50,000 people in the whole county. So I asked a lot of questions and found out who to talk to and pushed my way in. I worked for one month on the set and have never whorked so hard in my life. And never got such a great education. I worked with a great Brit named Mick Killgallan (sp?). He has a business with another partner, who I never met, in North Hollywood, called "Movie Art". His list of movies for a portfolio reads like a who's who of every huge movie you could imagine....All the Back To The Futures, Rocky's, Terminators, Universal studio movies up the wahzoo. He worked on so many, he never even cared if his name got on the credits or not. He said it never meant anything anyway. He learned his trade as an apprentice in England and then happened to live next to where they stored the old Carousels that were over 100 years old and traveled around every year to fairs and came back to the warehouse for touch-ups every year. He was amazing to work next to. FAST! Historically correct, perfect. I learned so much and had so much fun. couldn't keep up with his "Pub Crawling" tho. Those Brits sure know how to drink! Anyway....my big claim to fame was painting the wheel barrow that Bif fell into that was filled with manure. Also met Michael J. Fox (a truly neat guy!) and got my fill of the crazy, behind the scenes antics of the movie world. I also did all the signs for "Bad Girls" (an A+ really bad movie). Then the director got fired and they moved the whole film to Texas where someone else did all the signs (of course, not as good as mine ) all over again and mine were never to be seen. . Unfortunately, the whole set that was built for Back To The Future burned down and was never re-built. The county, in all its greed permitted Universal Studios to death, to the point that word was spread that our county was a pain to work with and we rarely have gotten more movies made here. I've worked on a few commercials, but nothin' in about 8 years or more. Back To The Future was in 1989. My big claim to fame. 90% of all signs made are never seen, but must be painted just in case there is a glimpse of one by a camera angle. 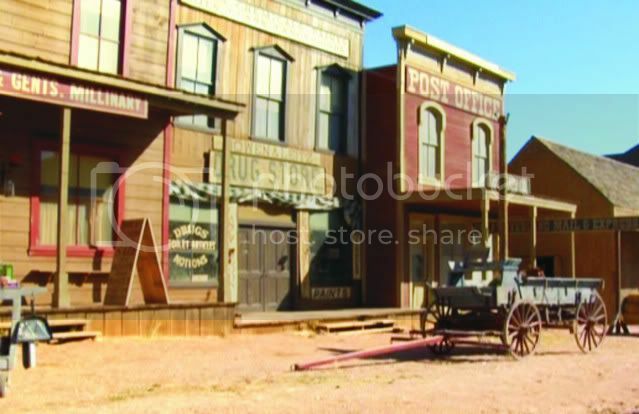 I painted a stage coach, the banner over the street advertising the big dance, and many signs along the street and another claim to fame was a dirty paper sign that was posted on the sherriff's office to say he had to go outta town. To age if, I stomped on it in the dirt, crumpled it opend it, painted on it and made sure that the spacing was all off, then stomped it some more and then we hung it. Highly technical stuff. It was a blast to see how things are aged for the movies and how to make things really quickly and still look great. It was a really memorable time in my career. Judy, Funny you should mention Mick Kilgallon here, he was the first signwriter I worked with in England after art school in the early 70's, a very knowledgeable sign man & artist of the old school. We worked together for several years on a variety of projects. He later came to California & we worked together again for a while till he opened MovieArt, which is still running. in the last month, i patched up some gold leaf in a "location", a local Mansion in vancouver, the the crew had damaged, did a B& B sign, this all for the L Word, then a gold window job for a feature, "Marriage, and for the last 3 weeks, hve been lettering all out for banners, etc, for "Hotrod" another feature(a guy jumps school busses on his Moped, all for a good cause...hi-jinks ensue, as usual! Got ok from art dept tp use my style on certain parts, always a pleasure! Way cool! Please tell Mick"hi" when you see him, for me. There is a man who is a plethora of info and talent. It was so much fun working with him. I was the new kid and he treated me as an equal. In the movie biz, that's rare. He's a very special person. I would love to see him again AND work with him. Back To The Future was a special time for me and for the fine art of historic handlettering. Amen to that. I am just pleased that I pushed my way into the experience. 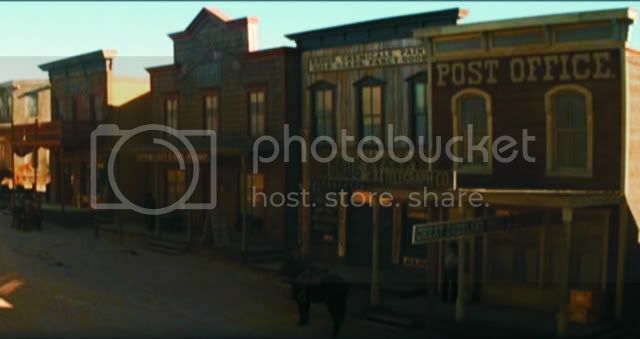 On the DVD for the movie Appaloosa, there is a real interesting short on the design and construction of the town of Appaloosa. The short shows most of the sign work better than when you see it go by in the actual movie. I copped some stills of the sign work and posted them below. There was no credit given specifically for the sign work in the credits. There were a few other shorts worth viewing too. -Aho! Last spring I worked on the movie "Public Enemies", which has yet to come out. 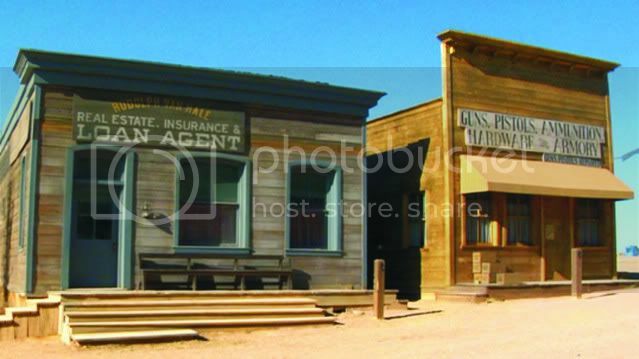 It was filmed in various locations in the Midwest. It stars Johnny Depp and Christian Bale. Its a twin tale about some of the notorius bank robbers of the time, John Dillinger and Baby Face Nelson. One such location was Columbus, Wisconsin. A small town with crossing Main Streets. The movie company rented out the town for a few weeks, almost a month, if I remember right. They took it all apart and put it back together the way they wanted it to look, Circa 1930's. We were given plans, patterns, and plenty of paint. We worked from before sun up to after the sun went down. There were a handful of painters and just two of us signwriters. And we had plenty too do, lettering Store Fronts, Hanging Signs, Vehicles, Windows, etc. The plans were done by the art dept, with plenty of photographs for examples. The patterns were done via a plotter. We were given a little wiggle room to make alterations to the patterns. As I lettered away, I could hear the voices of the old timers, telling me..."Thats not the way you make that sign/letter boy!" And I concurred whole heartedly, "yeah I know, but thats the way the pattern is." After about two days, my lettering skills were back up to par, as I hadn't hand lettered in over 5 years. It wasn't so much about being exact or precise, it was more like going for a mood. I was trying to emulate an old timer and their lettering ways. So that the signage in the movie would have that feel. I didn't want it to look cookie cutter plotter exact with distorted letters. Not everyone is as studied as some of the older signpainters are (were) when it comes to making the right looking sign. Most of us here on this site know of the old school sign makers, that would snap a line, chalk out some letters, and paint strokes straight, true looking circles, and crisp serifs. No having to look for a vector font that would fit, they made it fit, and it looked great. Anyway, If you get the chance to see the movie, please do, and let us (me) know what you think. We did no gilding, just paint. But there may have been gilding on other sets in other towns. But not on our location. I have some pictures of the work we did, not sure if I can post them or not. But as we painted away, they let tourist and towns folk take pictures, so Im sure I could post a pic or two, but just want to get a legal response from the site monitors here first. I did some looking for a "Public Enemies" Movie Trailer, There are some on YouTube. I don't know if you had to sign non-disclosure agreements or similar contracts to work for the film company. If so, I'd follow those agreements. Since your photos are stored on your site or server, all you are doing here is adding a link to them. I am guessing the company wouldn't want you to give away any of the story or plot. Of course, you could always ask them up front before posting any images. oatis wrote: I love the signs in "Road to Perdition" with Tom Hanks as the mob enforcer trying to raise a family. Been a whole isnce I watched that movie, should re-watch some time, recently rewatched Cast away and the green mile, two good T. Hanks movies imho. You can see some my work in the movie "Peggy Sue Got Married", "Tucker" and "Howard the Duck". My Father Warren and I worked in conjunction with Barber signs. Peggy sue got married and Tucker had the most period pieces to recreate. Katheryn Turner and Micheal Douglas enjoyed watching us while Lettering Show cards, Micheal would meet up with Katheryn while he was filming Basic Instinct, both of them in raincoats hats and Ray-Bans to avoid fans. Was also lucky enough to have lunch with Director Francis Ford Coppola. There was some nice signs and a little sign painter scene in the Guillermo del Toro film, "The Shape of Water" (which was great by the way). Does anyone know who worked on them?